I’ve not posted anything publicly about my mate Steve – because I wanted to respect his privacy. However he’s told me that he’s fine with me putting something up on this blog – and so here goes / with his permission. Steve a couple of months back discovered he had prostate cancer. As many of you know, he’s a champion body builder – and has taken testosterone regularly over a long period. People on regular testosterone have a pre-disposition to contract prostate cancer, and so Steve has had regular checkups to monitor his PSA levels – the indicator that a cancer might be forming. Steve told his his PSA levels were always high, however a couple of months back he had a blood test which concerned the physicians, and so he had further tests which revealed that yes, a cancer was forming. Steve determined, on his physicians advice, that they should remove the prostate altogether. I talked to him shortly after he’d received this news, and then not long before he was to go into surgery to get the prostate removed. He was very relaxed about it all – said he had a great doctor, one of the best hospitals for this kind of procedure in the US, and he thought he’d be back in the gym within a week. I won’t go into details, but there were complications right from the get-go. Now, about a month after the operation, he can only get around with the aid of a walker. He’s been on high level painkillers all this time – and up until a short while ago no-one knew exactly what was causing his immense pain. Steve cannot walk, cannot lift his legs, he struggles to move around his apartment. I spoke to him yesterday and he’d just had the results back from a MRI which showed that perhaps the pain was coming from “inflammation” of the groin and lower torso. Steve thinks he might have picked up some kind of infection while he was in hospital. Irrespective, the situation is that Steve, one of the fittest 73year olds you’re ever likely to meet, has been reduced to a near cripple. He’s maintained terrific spirits – although at times he’s expressed to me his frustration at not knowing what was wrong – but he has innate fitness and he’s a healthy guy, so once the medicos figure out what’s exactly wrong and treat it accordingly, he’ll bounce back fast. But it’s been a huge ordeal. And continues to be. The poor bugger. Jennifer and I drove down to Houston to meet with him while he was in ER – and I phone him regularly – but I wish there was more that I could for him. Please feel free to leave messages here – or if you want to contact him personally outside this blog let me know and I’ll send you his email address. 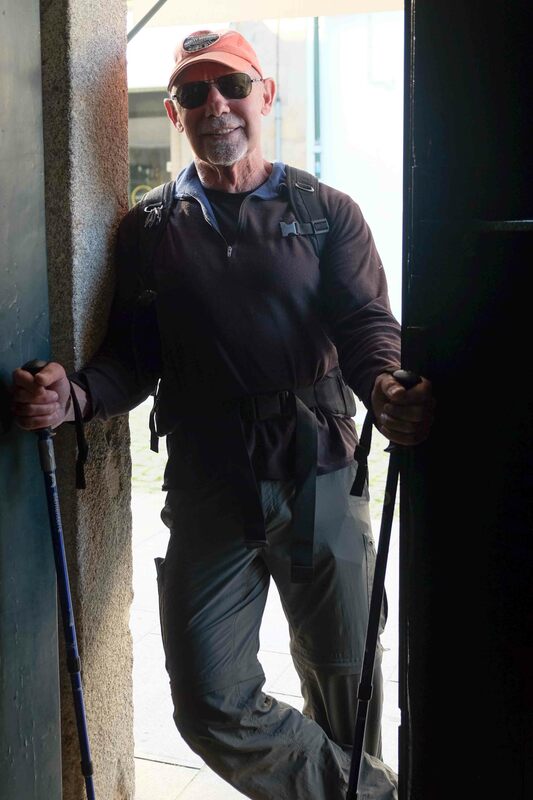 Here is a shot of Steve on the Portuguese Camino when he was in good health. Hi Steve – every, EVERY best wish to you for a speedy recovery. I hope that the doctors get to the cause of your pain asap so you can continue with your recovery programme. Knowing, through PGS, how dedicated you are to health and fitness, I’m sure that you will give it 110% of effort and energy to become totally well again at the earliest possible time. Kathryn and I send you our blessings for a sound body and a sound spirit. I was deeply affected when I heard the news about your cancer. We haven’t met in person but please know you’re in our hearts right now. Dear Steve, I wish there would be a “this really suks” button. Nothing to like about here other than that Bill posted. From reading some of your Facebook entries you are keeping a remarkable upbeat attitude and please do continue to tell this desease to ” bug off”. Never stop fighting. Thinking of you a lot…and as I do believe in the power of prayer…you are in mine. Blessings to you for pain free days asap. And wishing you wonderful care and treatment and a speedy recovery. My best wishes to you, too! Finding it “interesting,” even through the painful and frustration parts, is a good sign. Thanks for all the wonderful well wishes. Means a lot, and yes, Ingrid, I too believe in the power of prayer and via Facebook have had an amazing number of folks offering prayers on my behalf. A few clarifications and comments. Yes, I have been on testosterone replacement therapy for years via a very highly regarded Urologist in Houston. However, a widely misunderstood myth is that testosterone brings about prostate cancer. The truth is that testosterone does not cause prostate cancer, but once you have prostate cancer, it may feed on testosterone. They still do not know what causes it. I was diagnosed with a very small prostate cancer on May 10th, which was moderately aggressive, so after a couple of days of thinking it over and talking to my surgeon, I decided to simply get rid of it while it was small and contained. To the best belief of my surgeon and myself, I am completely rid of prostate cancer and it will never be an issue again. The surgery went fine. This surgeon does 8 or 9 prostatectomys a week and nothing else. He is the best. The recovery, however, has been a completely different story. First off, I immediately developed an Ileus which means the bowels do not wake up after anesthesia. Therefore your abdomen becomes painfully distended for days and your stomach also. Day 3 my surgeon called in a general surgeon which confirmed the diagnosis and put an NG tube down my nose to suction my stomach. That is an awful procedure, but it relieved the pressure on my stomach and thus my diaphragm for the next 54 hours. Once my bowels started back working it was a matter of working me up to a regular diet. Throughout the nine days in the hospital, at everyone’s advice, I walked and walked and walked. That is the remedy for an Ileus. Well two days after being released, I went to the ER because I could hardly walk. They did some tests, found nothing wrong, and sent me home. 4 days later I returned to the ER by ambulance because I could not walk at all. They found a urinary tract infection and gave me IV antibiotics and again sent me home even though I could not walk. This is the day that Bill and Jennifer drove 4 hours each way from Dallas just to visit with me in the ER room and cheer me up. They are amazing friends. There has hardly been a day go by that he has not checked on me by phone while he has been in the states. Amazing. Dale and I were looking forward to meeting you in India but recovery here in the States near your doctors is best now. If you were to go to India we all would help you get around as you are family after two years of all of us communicating. There will always be another trip with Bill and Jen in the future and who knows the PGS premiere might be in Dallas? Sounds like the cancer is gone (yippee) and I am sure they will soon figure out the remaining issues and start you on a better road to recovery. I’m sure all of us are sending you best speedy recovery wishes and loaning you an angel or two to help you through this. Oh my gosh, Steve! Sending you prayers and blessings! Your previous good health just may have prevented this from being even worse! Hang in there!!! Hi Steve, it’s Piet de Vries here. I’m Bill’s good friend and his cinematographer on this recent PGS US leg. I’m just writing to let you know that along with Bill, Jennifer all the folk that know you, I too am thinking of you. It’s tough for you I hear, but you’ve already achieved so much, so I wish you the successful recovery you deserve – a recovery that will in turn, enable you to finish the things you want to do. Hi Steve! You don’t know me at all, but I know you from Bill’s stories about his past caminos. I’m sending positive vibes all the way from Belgium, and wish you a very speedy recovery. I have been reviewing some of Bill’s back blogs and came across this one which frankly, I had forgotten about. It came to me, with a shock, that I did not thank all of you for your well wishes and prayers. I apologize and want to take this opportunity to do so. It means the world to me to have friends across the world, some that I may never meet, but nonetheless friends that care. Thank you from the bottom of my heart. AGAIN, THANK ALL OF YOU FROM THE BOTTOM OF MY HEART AND PLEASE FORGIVE MY TARDINESS.